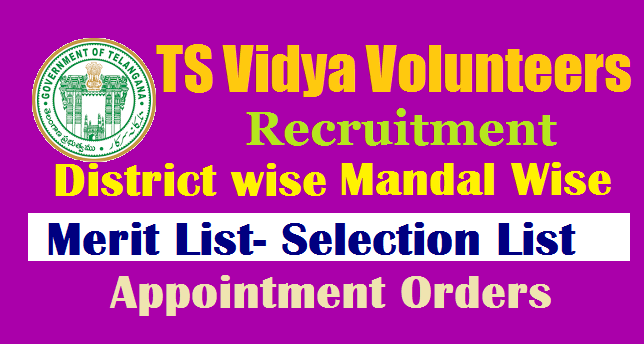 TS Vidya Volunteers (VVs) District wise Merit List /Selection List 2018-19-Telangana VV's Appointment Orders 2018.TS Vidya Volunteers (VVs) District wise Merit List /Selection List 2018-19-Telangana VV's Appointment Orders 2018, TS Schools Vidya Volunteers Merit List /Selection List , Telanagana VVs selection list, Telangana Vidya Volunteers Merit List/ Selection List Dist Wise appointments 2018-19, TS Vidya Volunteers (VVs) merit list 2018, Recruitment of ts Vidya volunteers merit list , selection list , telangana vvs selection , ts vidya volunteers merit list,Vidya Volunteers appointment list telangana vidya volunteers General Merit list, TS Schools 15661 Vidya Volunteers(VVs) selections 2018, Notification-New Guidelines,Selection Procedure. TS Schools Vidya Volunteers Merit List District Wise Selection List released for the academic year 2018-19 to fill up 16781 Posts in Telangana State. Here we are providing ts vv's merit list 2018 and telangana vv's selection list for the session 2018-2019. Telangana State government has decided to appoint 15661 Vidya volunteers on a temporary basis for one year vide G.O.Rt.No. 48 Dated: 02-06-2018.. The vacancies as per new strength as on 30.06.2016 and as per new rationalization guidelines. Interested Candidates to work as Vidya Volunteers may have to Applied Online for Vidya Volunteers/ VVs/ Academic Instructors Recruitment in Telangana from 13.07.2018 onwards. TS Vidya Volunteers Online Application Closed on 16-07-2018 in 31 Districts of Telangana state. Apply Online From 13-07-2018 to 16-07-2018 , Submission Of Printout Copy Along With Certificates To MEOs Upto 16-07-2018, MEOs TO DEOs Upto 17-07-2018, Selection At DEOs Upto 18-07-2018, Verification & Issue Of List To SMCs By MEOs On 19-07-2018, Engagement Of VVs At Schools From 20-07-2018. Mandal is the unit for engaging of Vidya Volunteers basing on the roster points allotted to the Mandal. Merit lists shall be generated for each Mandal. As far as possible Candidates belonging to the same Mandal shall be engaged as Vidya Volunteer. If qualified Candidate is not available for a particular roster point in the Mandal, Candidates from the other roster points may be taken from the same Mandal. For Example : If no ST (W) Candidate is available in the Mandal , ST (Men or Women) i.e., General (G) may be considered . If no ST candidate is available in the Mandal , SC (W) may be considered . If no SC (W) Candidate is available in the Mandal , SC (G) may be considered . If no SC candidate is available in the Mandal ,following sequence shall be followed BC A (W),BC A (G),BC B(W), BC B(G),BC C(W), BC C (G),BC D(W), BC D (G), BC E(G) , OC(W),OC(G) . If Candidates are not available in the Mandal , same category of Candidates from neighbouring Mandals may be considered based on merit. TS VVs Merit List: The DEO shall place the merit list of the Candidates so prepared before the District Level Committee comprising - District Collector; Project Officer, ITDA/Addl. Joint Collector/Chief Executive Officer, ZP and District Educational Officer as the Member Secretary. The District Collector shall personally head this Committee and oversee the entire process of engaging these Vidya Volunteers. After finalisation of the lists of Vidya Volunteers by the District Level Committee, the same shall be communicated to the Mandal Educational Officers for onward communication to the School Management Committees for engaging the Vidya Volunteers in the school. Any grievance on the above order lies in Appeal to the Director of School Education within a week from the date of publication of the lists by the SMCs. The Cluster Head Master concerned shall be given the responsibility to coordinate with the SMCs concerned in engaging Vidya Volunteers. SMCs will enter into an Agreement with the Vidya Volunteer in the prescribed format. TS (VVs) Vidya Volunteers Recruitment 2018 Merit List Results: TS VVs Results, TS Vidya Volunteers Results, TS Vidya Volunteers Merit List Results, Telangana Vidya Volunteers Selection List Results to be declared on July 19, 2018 on Vidya Volunteers Recruitment Website. TS Vidya Volunteers Recruitment 2018 /TS #VVs Online application form 2018/ #Merit lists/ #Selection Lists, 15661 #VidyaVolunteers Recruitment Notification 2018 in Telangana, District wise VVs recruitment Online application form @ http://ssa.telangana.gov.in/ Last date for apply online, Selection procedure, VVs recruitment guidelines, How to apply and selection list/merit list preparation procedure details given here. Govt of Telangana has decided to appoint 15661 Vidya Volunteers in existing vacancies as per new strength as on 30.06.2018. Candidates who want to work as VVs may have to apply online at TSSA web portal @ http://ssa.telangana.gov.in/. The online application form submission link opened upto July 16 and district wise vacancies are announced along with notification. 15661 VVs Recruitment and Honorarium(Salary) Enhanced GO.86 details given here.